My sister-in-law and her husband are here in the U.S. for a three month vacation. They have been for three weeks now. Every weekend, we have plans for them like going shopping at outlets, see various tourist spots around New Jersey and New York or do cookouts and barbecues with relatives in our backyard. Last week, it was my husband’s brother who also lives here who brought the visitors to North Carolina for a week vacation. They just got home two days ago. Tomorrow or should I say this weekend is our turn to bring them to Maryland and see some of their friends. It has been confirmed just now by people from Maryland that they are expecting us tomorrow. Because of our trip, we have to make adjustments with regards to our other plans for the weekend. First, the van (which we are using tomorrow) will go for oil change today instead of Sunday then I have to shop for the best baby blankets for my cousin who is expecting. She lives in South Jersey so we can stop at her house tomorrow to give my present. This will be a big surprise for her. This trip is unplanned so my cousin thinks I am sending her present through the mail. I hope she likes it. Before I made my decision on what baby blankets i should buy for her, I even check out these other uses! I hope all my errands are done by 7:30 p.m. Why, because I want to watch the opening ceremonies of the 2012 London Olympics live on TV tonight. If time is running out, we will just have a take home dinner at eat while watching the Olympics. There is a new restaurant that opened in town called pei wei. it is owned by p.f. chang which serves asian food like lo mien, pad thai, teriyaki, mongolian beef, etc. and this crab wontons as one of the appetizers. It is made of crab with cream cheese. It is yummy, creamy and crunchy on the outside. 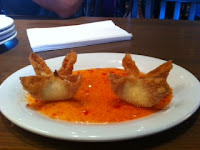 i like the presentation with their famous sweet and sour sauce. i took this picture through instagram. I am referring to our receptionist in the office. She is not a direct hire by the company. My boss got her from a temp agency when the former receptionist came to work that day just to tender her resignation and left. There was no two week notice at all. I was not sure if the two week notice is required for all employment contracts but it is only proper to give your employer the chance to hire a replacement before you leave. I understand if some type of misunderstanding happened at the office that made you quit your job, but none. So to cover her job immediately, we had to call a temp agency. That is how our current receptionist got into the picture. She is a working student, very polite and articulate when she talks to customers on the phone. My boss right away liked her job attitude. Yesterday marked her 6th month in the office. My boss surprised her by hiring her as the receptionist permanently. She did not expect it. She was all smiles when she left my bosses' office so we knew right away it was good news. We are all happy for her as well. Yes, Jollibee is here in New Jersey. Our first ever. It is located in Jersey City, NJ. It opened around a month ago. NJ's Jollibee is the second one on the East Coast. The first one is in New York City which opened around 3 years ago now. This is one is more accessible to us and no need to pay tolls anymore to eat our favorite chicken joy, palabok and peach mango pie. Not too long ago, I wrote about my car’s milestone; reaching its 100,000 miles. To date, I am still driving my car at 133,000 miles! It is still in good running condition with only minor repairs (knock on wood!). However minor it is, once the engine light comes on, I still panic right away and would switch cars with my husband the next day. The most recent of my panic attack was when I was on my way home from work. But even before the check engine light came on, I already had two instances where my car would die while in idle and thankfully it starts back up. It was on the third one that check engine light came on and stayed. How I wish the car has switches that can just turn the check engine light off. As soon as I got home, I asked hubby to bring the car to the shop and run a diagnostic test to see what is going on. The test gave him a code P0340 camshaft position sensor with list of probable causes like open or short circuit condition, poor electrical or weak battery condition or faulty camshaft position sensor. Although the part is available at the car parts store, we did not buy the part itself; we left to our mechanic to give us a quote for both parts and labor. He is one of the trusted and reliable mechanics we have known and who does not overcharge. ,To make the long story short, my car got fixed and the check engine light is now off. We have been preparing for the day that my car would not be drivable at all. At this point, my big thanks for the services and comfort it has given us for the past 9 years. We started looking for a replacement but we have not made a pick yet. Which cars are we eyeing for? There are three, all are 4 cylinders only. We are still debating which of the three. ,Why not get a hybrid? That is another to consider too. But let’s see. We will let you know.